Tsun is the Nordic god of trials against adversity. Shield-thane of Shor, he serves as the guardian of the Whalebone Bridge to the Hall of Valor. 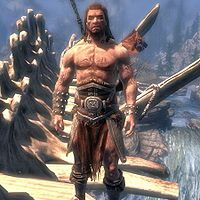 When you first encounter him in Sovngarde, he will ask you by what right should you be allowed to enter Hall of Valor. Following this, you must prove your strength in combat against him in order to gain entrance to the Hall. After you defeat Alduin, Tsun teaches you the Call of Valor shout and sends you back to Skyrim. He wears unique armor and boots, and carries a unique battle axe. He is completely immune to the Unrelenting Force shout, although he has the ability to use a one or two word version of it against you in battle. For historical information on Tsun, see the lore article. "I am Tsun, shield-thane to Shor. The Whalebone Bridge he bade me guard and winnow all those souls whose heroic end sent them here, to Shor's lofty hall where welcome, well earned, awaits those I judge fit to join that fellowship of honor." "A fateful errand. No few have chafed to face the Worm since first he set his soul-snare here at Sovngarde's threshold. But Shor restrained our wrathful onslaught - perhaps, deep counselled, your doom he foresaw." "You trespass here, shadow-walker. Shor does not know you. Perhaps before the end you will earn the right to pass this way. Welcome I do not offer, but your errand I will not hinder, if my wrath you can withstand." Once he remarks about your right of entry, he can be asked once more about entry into the hall, to which he replies: "Living or dead, by decree of Shor, none may pass this perilous bridge 'till I judge them worthy by the warrior's test." After this, Tsun equips his axe and battle initiates against him. Once Tsun's health has been depleted by approximately 50%, he will yield, stating "You fought well. I find you worthy. It is long since one of the living has entered here. May Shor's favor follow you and your errand. ", and allows you to cross the bridge and into the Hall of Valor. "That was a mighty deed! The doom of Alduin encompassed at last, and cleansed is Sovngarde of his evil snare." After you defeat Alduin, the mist of Alduin's soul snare dissipates and the sky clears, Tsun congratulates you on your mighty deed, as do the ancient Nord heroes and all the souls lost in the mist, who will make their way to the bridge. When approached again, Tsun will mention: "When you are ready to rejoin the living, just bid me so, and I will send you back.". You can choose to stay a little longer or immediately return to Skyrim. Before sending you back, Tsun will teach you the Call of Valor shout. "Tarry not too long - the land of the dead is not meant for mortals to linger." "Return now to Nirn, with this rich boon from Shor, my lord: a Shout to bring a hero from Sovngarde in your hour of need. Nahl...Daal...Vus!" "I've waited long for such a worthy opponent." "The joy of battle burns in your heart!" "The path is closed, till your courage is tested." "Shor's Hall awaits, if worthy you prove." "Prove worthy by warrior's test, and cross the bridge to the blessed hall." He is voiced by Thor Edgell. Tsun is one of the tallest NPCs in the game. If you exit dialogue with Tsun and try to cross the bridge to the Hall before fighting him, you will be killed by lightning about halfway across. Tsun cannot be disarmed, staggered, or paralyzed. He is however susceptible to the Ice Form shout, and can be lifted up with the Vampiric Grip ability of the Vampire Lord. Should Tsun fall off the bridge and into the chasm below, he will reappear shortly and exit from the Hall of Valor. Ranged attacks that should strike his head will instead pass through him with no effect, due to his hitbox not covering his body above the shoulders. This page was last modified on 4 February 2019, at 22:27.